The flame and graphite furnace is integrated into one instrument. The change over from one technique to another is carried out by simple key strokes within the software. Instruments have a motorized 8 hollow cathode lamp turret which allows the automatic positioning and optimization of each hollow cathode lamp by the software. The spectral bandwidth is automated and is available with choice of five slit sizes. Advanced Graphite Furnace. Horizontally heated platform graphite tube. The unique design of graphite furnace reduces the chemical interference effects and memory effects by uniformly heating the graphite electrode. The computer controlled heating program allows the users to select the best heating program for analysis. 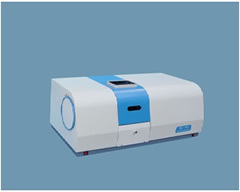 The optical temperature during the atomization stage ensures the rapid heating and rapid analysis. This helps to extend the life of graphite tube and enhance the analytical accuracy. Safety Functions Burner identification, Flame Sensor, Gas leak sensor, Low gas pressure sensor, power loss protection, gas loss flame protection. The flame and graphite furnace is integrated into one instrument. The change over from one technique to another is carried out by simple key strokes within the software. The instruments have a motorized 8 hollow cathode lamp turret which allows the automatic positioning and optimization of each hollow cathode lamp by the software. The control of the gas flows for the fuel gas (C2H2) and the positioning of the burner is also carried out directly from the software thus allowing optimization of the instruments for the best analytical parameter for a selected analysis. Two methods of background correction are available. The first utilizes a deuterium lamp and the second is the proven method of self reversal. The location of the wavelength and peak selection is automatic and controlled from the software. The spectral bandwidth is automated and is available with a choice of five slit sizes. The electronic parameters for the photomultiplier detector, the hollow cathode lamp current and the balancing of the absorbance and background energies are controlled from the software. Safety Automatic ignition and mixing air-acetylene gas with safety control. Heating Voltage feedback control when dry and ashing, Optical temperature control when atomizing. Heating program Up to 9 steps with choices of ramp, temperature increase and full-power heating. Background Correction Deuterium Lamp Background Correction: 1.0Abs self-Reversal Background Correction: 3.0Abs. 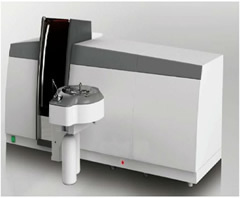 Date processing Analytical method- flame,graphite furnace and hydride.